And so, I have agreed to write a novella for Simon Marshall-Jones at Spectral Press. He offered me something I couldn’t possibly refuse: this illustration as a cover. 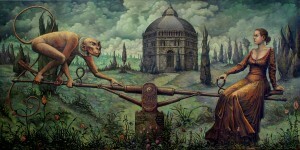 It’s called “Die Hexenwippe oder-waage” (The witches’ seesaw or scale) by Michael Hutter. I already have ideas and such, but the novella won’t be out until about 2014 or 15 (if I get my write on before that). So, go and make yourself a cup of tea. This entry was posted in News and tagged "Die Hexenwippe oder-waage", michael hutter, Simon Marshall-Jones, Spectral Press, The witches seesaw or scale. Bookmark the permalink.